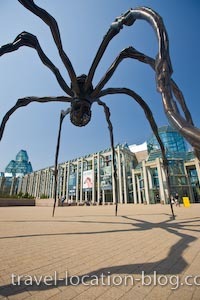 Picture of a large spider like sculpture near the entrance to the National Gallery of Canada in the city of Ottawa, Ontario. at the National Gallery of Canada. A major attraction in the city of Ottawa in Ontario is the National Gallery of Canada. Sculpture named Maman outside the National Gallery of Canada in the city of Ottawa, Ontario, Canada.